Just got notified of another book review for the Traveller’s Guide to the Duat, which you can find here. One of the assignments I was given as part of my Craft training was to study my seasons of the year. This is an interesting project and I recommend it to others (I had to develop a six-beat cycle rather than follow a four-season or eight-sabbat model in order to get something that both made sense and was functional, myself). When do you tend to fall in love? When do you tend to fall apart? When are your uptimes, your high-energy high-creation powerhouse moments? When are you quiet? Winter is a quiet time, an incubatory time, for me. When my various illnesses are particularly bad, I mostly become torpid and want to sleep through the whole damn thing; the rest of the time I am nurturing the quiet until – come the warmth again – everything pops free and I have a tendency to engage, engage, engage, making everything grow until I crash in late summer. So here we are, in the quiet conclusions of the Mysteries, with Nehebkau gathering the souls together and binding them in transformed state. The seed is planted. 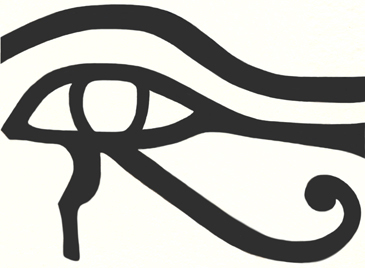 As Wesir goes into the Duat, as the grain is concealed under the Nile silt, as the sun spends more of the day in darkness, the seed is planted. It goes to spend its time in the dark – and as these things are given into the dark places and the quiet ones, the entombing that is the planting time – they are given their space to grow, until their Peret does come. What are you planting now? What is being given its chance to incubate? A worthwhile ponder to be having. I think it’s very important that travel books should have maps. This, of course, is the map of the world, showing the location of the Duat in relation to more familiar territory. 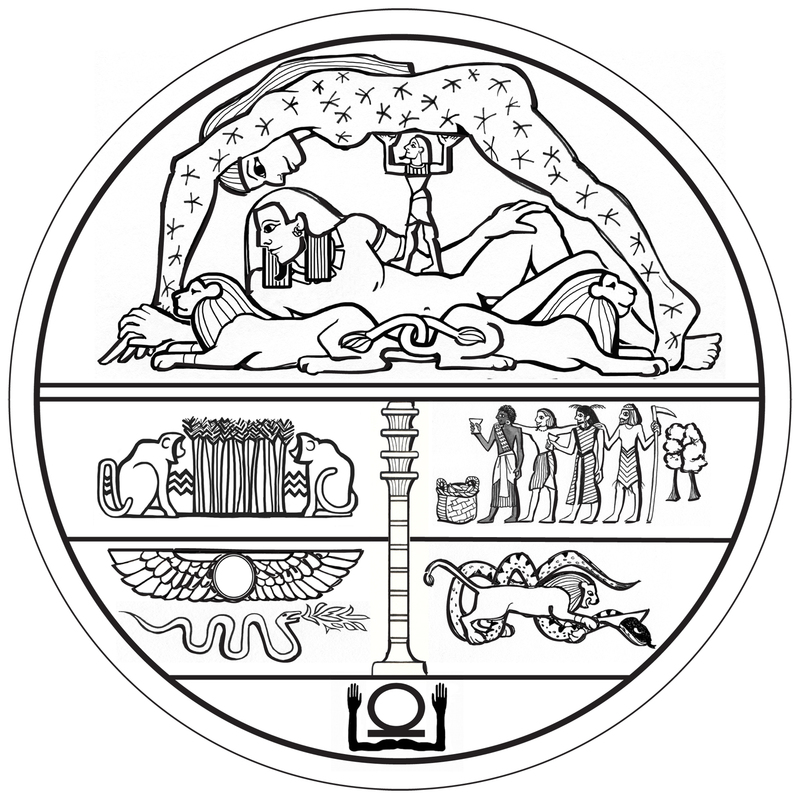 The familiar definers of the Seen World, Geb and Nut, dominate the top half of the map, separated by the figure of Shu who creates space between them for, you know, everything else. Though they are held apart, their fingers still twine together affectionately. In front of them, the double lion Aker (whose halves are Yesterday and Tomorrow) governs the horizon, the place where the Seen and the Unseen meet. I noticed when I was trying to build a mental map of the Duat from the perspective of what was written in the Amduat, the regions closest to the “surface”, lying adjacent to the horizon in the lands of dusk and dawn, were rich and fertile. Wernes, on the sunset side of things, is largely filed with the rejuvenating flood; the baboons praise the sun as it goes by. (The baboon, one of the sacred animals of Djehwty, is observed in the wild to raise its hands and cry out at dawn.) On the dawn side, the Fields of Hetep (that famous Field of Reeds to which the deceased aspires) are closer to harvest-time. You can see in the map all four of the races of man as conceived by the Egyptians hanging out and having a good time: Nubian, Egyptian, Libyan, and Asiatic. (As four was a number with a significance of completion, portrayals of the “four races” represented “all of humanity”; there is artwork with four each of the four races, so all of all of everyone.) On the eastern edge of Hetep, the turquoise sycamores that are the gates of dawn are visible. It seems to me that most dream travelling probably remains within these closest regions of the Duat – Wernes and Hetep. This is, after all, where most of the folks that someone dreamwalking would want to visit hang out, as well as most of the productive and generative form. These lands are the most familiar and similar to the Seen World. Similarly, further away from the seen world, there is a broad span of desert – much like further away from the heart of Egyptian civilisation, the shielding and perilous desert lies. To the sunset side, the snake and nightmare-filled land of Sokar, who is upon his sand, Rosetjau, where the sunboat must become a fire-breathing serpent to have a hope of piercing through the darkness. To the side of dawn, the perilous hour in which the newly rejuvenated sun and entourage must face A/pep and destroy it, which is desert because the great serpent has swallowed up all the water and must be forced to relinquish it. Here be monsters – whether personal and intimate ones, as in Rosetjau, or cosmic horrors which must be faced as part of the community of gods. Various spiritual disciplines require crossing these deserts, of course, and I suspect everyone has some experience with being thrown into the desert – the dark night of the soul, the haunting nightmare, or whatever else – at some point in life, regardless of seeking out passage. Dreams can go here, but not usually pleasant ones. These more accessible portions of the Duat are divided into the sunset and sunrise halves on the map by a djed pillar. The djed, a symbol of stability, is sometimes referred to as the spine of Wesir; it is Wesir’s governance that keeps this entire space in order. I don’t actually think that the regions are as distinct as this might imply, but there is a difference in perspective that changes how one experiences Wernes/Hetep and Rosetjau. In the deepest part of the Duat, where it rides the border of Nun, is the cavern where the mystery of the midnight sun occurs. It is drawn in the charts of the Amduat as happening within a space shaped like a shen symbol, the looped sign for the eternal that gives its form to the cartouche that surrounds the names of kings. Here, the mystery within the shen is embraced by the ka symbol, suffusing it with life and magical potency. These are abstract symbols, because the transformational experience of the midnight sun, the union of Ra and Wesir, is a mystery, difficult to comprehend without experience. This is the room of initiation, the heart of the journey to mystical enlightenment. I for sure haven’t been there yet. The Guide is now available in ebook version! You can get it from Smashwords. You can get it for your Kindle. You can get it on your phone. You can get it … uh … pardon, I’m a little punchy and now I want to turn everything into a Dr. Seuss riff. I will note: the print version is going to be superior to the ebook version, because the print version has Michaele Harrington’s awesome interior artwork. However, I will be (with her permission) doing some blog posts about some of the interior art pieces in the future, so those people who want ebook versions will not be entirely deprived of the illustrations. Another Book Review for the Guide! In any case, I promptly broke out the search engine to see if I could find the review somewhere linkable, and here we go, in the archives of his reviewer’s mailing list: Mike Gleason’s review of the Traveller’s Guide to the Duat.